New York - A taste of monastic life is being offered to teenage boys by Holy Trinity monastery in Jordanville, New York. Active rest, tasks performed in obedience and daily attendance at divine services – this is the program of the three-week summer camp, designed not only for relaxation, but most importantly, for bettering oneself in a Christian way. 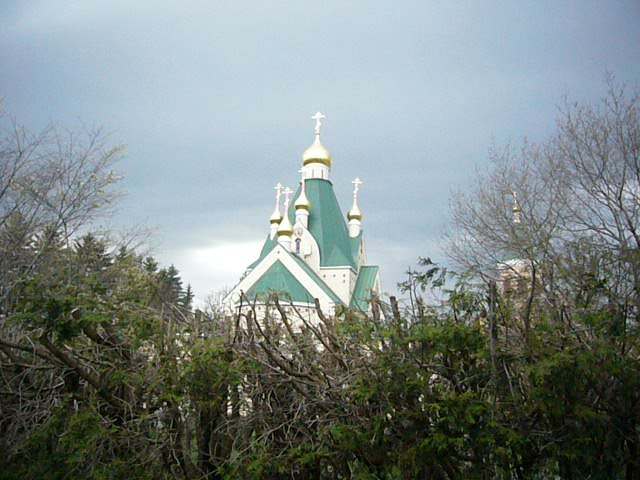 Holy Trinity Monastery in Jordanville is the heart of the Russian Orthodox Church Outside Russia; it is located in picturesque northern New York State, in a very small town, where there are no stores or restaurants, but only a single road, a library and a cemetery. For miles and miles around the monastery there are cultivated fields and pastures with sheep and cows. Here, in the quietness of monastic life, a group of participants between the ages of 15 and 18 will spend three weeks, working and praying with the monastic brotherhood. Here young men are immersed into the tranquil atmosphere of monastic life. They live in the house for pilgrims; they take part in the full cycle of divine services, they attend lessons on the Law of God and, of course, they rest surrounded by nature. The goal of the program is to introduce young men to spiritual life, to teach discipline and independence and to awaken their interest in the deep life of the Church and the seminary. It also gives them a unique chance to experience monastery life in both work and prayer and make friends with like-minded people. The life of the community is regulated by a strict routine, which the teenagers taking part in the program are also required to follow. The use of MP3-players and computers is absolutely forbidden. For three weeks, the participants do not watch television; they do not listen to music and they do not play video games. “All these electronic devices distract people from inward concentration and get in the way of discipline,” comments Fr. Boris. Everything is intended to fully immerse the participants in monastic life and to help them to go deeper into themselves. One of the tasks of the program is to let the kids take a rest from the overload of information, which is so prevalent in the modern world, and to teach them to appreciate nature and to value direct relations with other persons. Even the young men themselves do not complain about this rule. The summer youth program in Jordanville was in active operation from the 1950’s to the 1980’s. It drew more than one generation of the Russian Orthodox immigrants to the path of service to the Church. “Over 50% of the participants from those years are today actively serving the Church as priests, deacons or monks. The “summer boys,” as they are called, once included today’s well known pastors, including Fr. Victor Potapov, Fr. Stephan Pavlenko, Fr. Mark Burachek, Fr. Viktor Boldewskul, Deacon Viktor Lokhmatov and others,” comments Fr. Boris. “Unanimously they have told me that it affected them profoundly, even to attend seminary and become clergymen,” adds Willmarth. After a long hiatus, the summer monastic camp was revived last year with great success. The success of last year’s program is best reflected by how sad the kids were when it came time to go their separate ways and return home. According to Father Boris, some of the boys were asking the organizers to lengthen this year’s program to 6 or 8 weeks. This year it was not possible, according to Fr. Boris. Nonetheless, this year the organizers have a particular goal. “We are going to work on developing the talents God has given to the kids,” Fr. Boris said. The dates for this year's Holy Trinity Monastery Summer Youth Program are June 27th to July 17th. The sponsor for the program is the Fund for Assistance of ROCOR. You can register for the youth program in Jordanville and obtain more detailed information here.